Everyone wants a stylish, practical and functional interior to their home. But achieving that can seem like a distant dream. So what is the magic formula for a chic interior that is effortless and seamless? Are your frightened of using colour? Are you worried that investing in a dramatic colour it will give out every signal but the one you want it too? It is amazing the number of people who are nervous about choosing and using the ‘right’ colour when the truth is, there is no right or wrong colour choice. This certainly looks like a brave choice, leaving the wood panelled wall a very dark wood and complementing it with what looks like a mauve coloured grey on the walls. 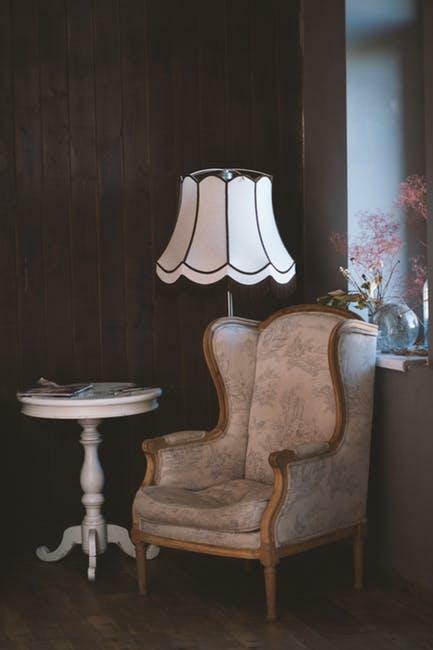 The white lamp with traces of black edging perfectly complements the white occasional table and the rather beautiful traditional style armchair. Choose one dominant colour in a room and lead off from there. Have you noticed the ‘frame with three’ principle? Cluster three items together to form a stylish group of objects, just like this chair, lamp and table. EVERY room needs a focal point whether it is the bathroom, the hallway or the living room. The best way to think of a focal point is to determine the point where everyone will look when they enter a room and from this, the eye will roam out across the rest of the room. It is a way of the eye making sense of a room. If you live in a Georgian mansion with a huge fireplace, you could make that the obvious starting point in a room. If you don’t have a fixed architectural feature or don’t want to dwell on the arches or the crevices of the room, then bring in your own. For example, you could invest in a modern rattan corner sofa, lending support to it with fantastic cushions in all shapes, sizes and textures. The thing with style is that even though there are prescribed elements to a certain interior design or trend, your own personality and take on what that style is, is essentially want makes it. The last you want is to be the same as everybody else. In this room, you can see that the whole room started with one key feature – the black-framed, half round window. 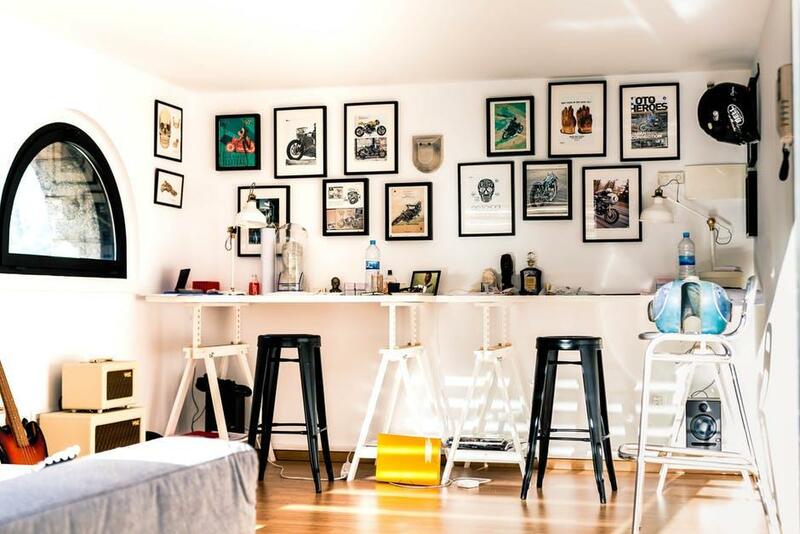 The two black stools are the next place where the eye falls with the black framed artwork, all delightfully out of line with each other. All of this is perfectly framed by the owner’s personal belongings – the guitar, the amps, the stuff on the worktop. Pleasant, homely and undeniably stylish, don’t you think? Designers understand the impact of both natural and ambient light in a space, something that can sometimes be lacking. Maximise natural light with minimal window coverings, especially in a darker room or where light is sparse. Natural light specifically alters the way we perceive the shade of a colour, so bear this in mind when choosing a wall colour. Play with ambient light because it too impacts a room. A soft glow will support a room, whilst a bright white light may be practical but it is harsh. Minimal doesn’t always have to mean decorating a whole room in white but you have to admit, it has a certain ‘something’ about it. Everything in this room has been carefully thought through and carefully placed. They have chosen to go with the white neutral palette in keeping with the minimal style. What stops this room from being flat are the materials, shapes and textures. The dashes of colour are well placed with the slat blinds also providing a dramatic backdrop. The floor lamp is elegant and overall, it has a minimal and modern appeal. And yet, there is one item that should shriek as being out of place in the modern appeal of the room. The old style telephone on the chest of drawers is a welcome distraction from the uber sleekness of the space. And that is your final hack – introducing a note of the unexpected doesn’t mean bringing in something that has to scream at the top of its voice ‘LOOK AT ME!’. It can sit there, beautifully unnoticed and then it pops into vision. Guest post by Rattan Direct an online retailer of high-quality rattan furniture. With some amazing furniture items for the interior of your home, take a closer look at this environmentally-friendly material.